Note: Today’s utility industry is in upheaval. All of the assumptions the business has run on have been turned on their heads. This post is the first in a three-part series looking at how analytics are helping utilities navigate this challenging landscape and find new opportunities for improvements in operations, customer satisfaction, and revenue. As they're facing a myriad of business challenges, today's utility leaders understand, and in some cases are embracing, that the bytes being generated from their infrastructure are just as valuable as the electrons they're used to managing. Text analytics. With applications ranging from safety to customer engagement to regulatory compliance, the ability to draw meaningful conclusions and predict future outcomes from unstructured, messy text data is becoming a critical business need for utilities. An important distinction here is not just the ability to read this mess of data, but to be able to draw conclusions, identify patterns, and predict future outcomes with a high degree of certainty. That's where the value lies in this data, which can include social media, call center call logs, field crew reports, survey data, and internal and regulatory documents. With this mix, data management becomes as important as getting to the analytics. Customer engagement. Utilities don't have a great track record when it comes to engaging customers in a granular, meaningful way. Today, however, we're seeing a growing number of utilities that are showing tangible benefits from using analytics to build the customer relationship in ways never before seen or possible; targeted program offerings and specialized billing programs come to mind. Using segmentation as a foundation and leveraging smart meter data, billing data, and third-party data sets (demographic, census and real estate data to name a few), utilities are engaging their customers with timely, relevant messages and offers that truly move the utility from being, frankly, a nuisance to being a trusted energy advisor. Grid and asset reliability. As intelligence spreads across the utility enterprise, transmission and distribution (T&D) and asset leaders are now seeing richer data environments to improve grid and asset reliability. This is, perhaps, moving the industry away from reactive grid operations and run-to-failure standards to a new era: the holy grail of the self-healing grid and predictive asset management. With the use of sensor data from the grid, weather data, and even smart meter data, predictive analytics models are emerging that are bringing decades-old grid and asset management practices into the 21st century. Energy forecasting. The energy forecasting landscape has changed dramatically over the last few years. The growth of distributed energy resources (DERs) has radically changed load curves, and the influx of smart meter data has exploded the volume of data available to support forecasts, making them more accurate and reflective of what's actually happening with the customer base. These examples illustrate, in a very simplistic way, that having a single, robust analytics platform can be the difference between success and failure in today’s digital and analytics-driven economy. The figure below is an example of what an enterprise platform for the digital utility looks like. Manage across the full analytics lifecycle. Analytics is not just about cool algorithms or a slick dashboard. It's about managing complex data sets, applying the right analytics at the right time, and operationalizing the results for maximum business impact. Embracing this entire analytics lifecycle should drive all of an organization’s efforts in building its analytics capabilities. Diversity, scale and trust. Can the platform scale to meet complex, diverse data sets for a variety of users, and can the results be trusted once they are operationalized? That’s a mouthful, but these factors should be measured and built into the development process of the enterprise analytics platform. 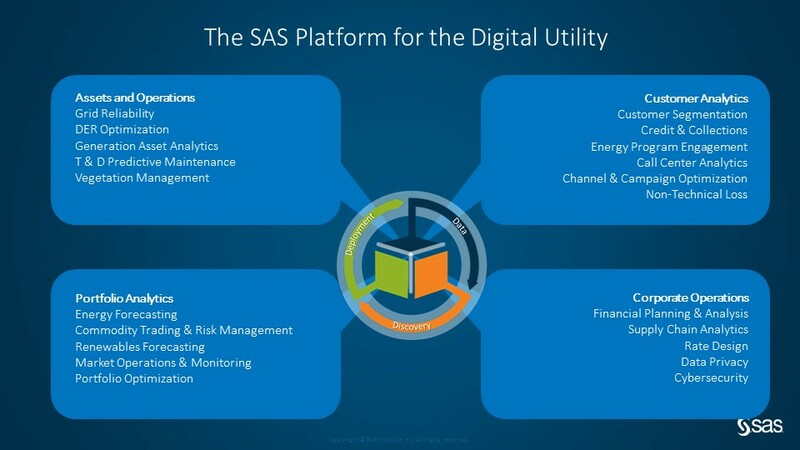 For a deeper look into how SAS delivers a unifying platform that can bring together diverse data and analytics to drive measurable value for your organization, check out this white paper: SAS in the Open Ecosystem.